[Brent Baker posted this item on behalf of MRC President Brent Bozell to provide for a discussion on his blog page about his TV appearance.] On Tuesday's NewsNight, CNN anchor Aaron Brown set up an interview with Bozell by complaining that “we were called a 'race-baiter' by a conservative media Web site. 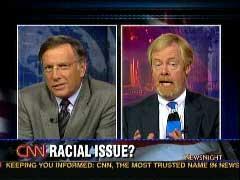 Needless to say, we don't agree, which made our conversation with the piece's author, Brent Bozell, that much more interesting tonight.” Brown pleaded to Bozell: “Why do you call me, little old innocent me, you know, why do you call me a 'race-baiter' for asking the question [clip from an earlier show]: 'Do you think black America is sitting there thinking, “If these were middle class white people, there'd be cruise ships in New Orleans, not the Superdome”?" Excerpts from the previous NewsBusters item and Bozell's column with which Brown took exception, plus a transcript of the September 13 CNN interview follow. CNN's Wolf Blitzer on Friday afternoon repeatedly prodded reluctant Congressional Black Caucus member Elijah Cummings to blame racism for delays in rescuing hurricane victims in New Orleans....Later, on CNN's NewsNight, Aaron Brown took up the same agenda with Congresswoman Stephanie Tubbs Jones: "What I'm wondering is, do you think black America's sitting there thinking, if these were middle class white people, there would be cruise ships in New Orleans?" When she wouldn't take the bait, Brown lectured: "Now, look, here's the question, okay? And then we'll end this. Do you think the reason that they're not there or the food is not there or the cruise ships aren't there or all this stuff that you believe should be there, isn't there, is a matter of race and/or class?" But perhaps the strongest news pitchman for the Vast Racist Conspiracy -- you know the one, like the skit on "Saturday Night Live" where Eddie Murphy paints himself white and they hand him free money at the bank -- was CNN anchor Aaron Brown. Brown baited Rep. Stephanie Tubbs Jones: "Do you think black America's sitting there thinking, if these were middle class white people, there would be cruise ships in New Orleans, not the Superdome?" Jones tried to put race aside, focusing her outrage on charging "the government has not allocated the resources." But Brown went back to his Love Boat for Whites theme: "Now, look, here's the question, okay? And then we'll end this. Do you think the reason that they're not there or the food is not there or the cruise ships aren't there or all this stuff that you believe should be there, isn't this a matter of race and/or class?" Aaron Brown: "Of all the complicated questions the response to Katrina raises, questions of race and class in the country rank right at the top. We have on the program on three different occasions talked about issues of race and Katrina, and the other day we were called a 'race-baiter' by a conservative media Web site. Needless to say, we don't agree, which made our conversation with the piece's author, Brent Bozell, that much more interesting tonight. "Brent, just dealing with the column you wrote on the 7th, the other day, to me, a fair reading of the column is that you don't want us to talk about race at all, probably class at all, but surely not race at all, as it may or may not relate to people's perceptions of the relief effort." Brown: "I don't support the notion that race, as such, is the issue here, though. I'm less sure honestly about class. I wonder the degree to which class played a role in how the government responded, governments plural, responded. I don't know. But I am interested in what people think, and I think it's my job to ask." Bozell: "Well, but, you know, it is appropriate to ask, Aaron. I don't question that, but when someone is making a very dangerous accusation, and by dangerous, I mean an accusation that splits the seam of the cultural fabric in this country." Brown: "If it's appropriate to ask these questions, which is how you began that answer, why do you call me, little old innocent me, you know, why do you call me a 'race-baiter' for asking the question-"
Brown, to Congresswoman Stephanie Tubbs Jones, in a clip from his September 2 show: "Do you think black America is sitting there thinking, 'If these were middle class white people, there'd be cruise ships in New Orleans, not the Superdome'?" Bozell: "You may say, 'Well, I'm just a questioner, I'm just a reporter, I'm just asking questions.' But, in fact, when people hear you, they believe that what's coming from you is not a question but a statement of fact. Now, you may say, 'Well, that's unfair because I don't mean it that way,' but that's the reality." Brown: "So journalists ought not ask these because their questions are perceived as statements?" Bozell: "I think journalists ought to be careful that they not create perceptions that are based on falsehoods." Brown: "How do you know it's perceived based on a falsehood unless you ask questions?" Bozell: "Well, I think that somebody making the accusation ought to have some evidence before making the accusation." Brown: "No one's, no, Brent, there's no accusation there." Bozell: "Well, sure there is. Sure there is." Bozell: "There are public policy leaders in New Orleans right now -- and they've been there for a week -- who have been making this accusation. I'm not saying the press is. I'm saying they are. But if the press's role, I think, ought to be to go to those people and say put up or shut up." Brown: "I think it is the role of the reporter to ask the question, even when the question is uncomfortable, and here I think that's all we did." Bozell: "Well, Aaron, when I see a reporter say those infamous words, 'some people say,' and then you go on to continue with the sentence, I'm always wondering who those 'some people' are. You know, if somebody's saying something, put that person's name on the record." Brown: "I actually think it's possible this is, be a moment for us." Bozell: "Holy moly, here it comes." Brown: "There really is an opportunity to discuss a complicated and important American question about race and class and poverty and how they fit together. And Katrina gives us that opportunity." Bozell: "There's something else, Aaron. Yeah, but there's something even better than that. There is the opportunity to celebrate the color-blindness that we saw after 9/11, the color-blindness that we saw after Hurricane Katrina in so many quarters. That ought to be celebrated." Brown: "I'll give you the last word on that." Brown: "It's nice to see you."